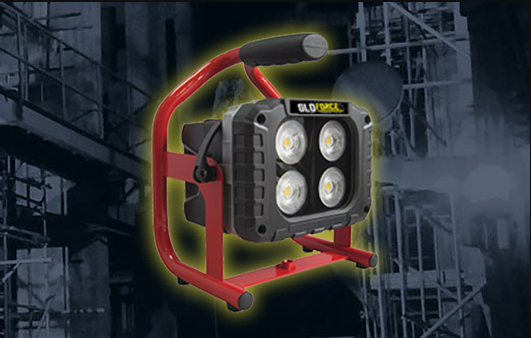 The EYE-LIGHT is the most versatile, convenient and all-in-one Site Light, Work Light, Flood Light and Inspection Light designed to deliver the light you need, when and where you need it. The G2000 and R4000 are dual detachable battery floodlights with high intensity light output and long running hours, for a full and reliable solution for mobile battery Site Lighting. The padmag is an adjustable tablet / ipad holder with a twist. Featuring a flexible, rubberised gooseneck you can find the perfect viewing angle with precision positioning like no other! Make use of its seriously strong magnet to stick onto metal surfaces, like cooker hoods and fridges. Or, attach it to the heavy-weight steel base (included) and use it as a stand. The gooseneck makes the best shapes, but if you need something a little longer, just screw in the 27cm extension and relax hands-free. GloForce is a specialist LED lighting company, focused on the innovation, engineering and manufacture of the most convenient and high-performing industry floodlights on the market. By utilising advancements in LED lighting and Lithium-ion technology, and in response to trade demand for better off-grid solutions that can improve work productivity. GloForce has designed a range of mobile lighting solutions that far exceed industry expectations. 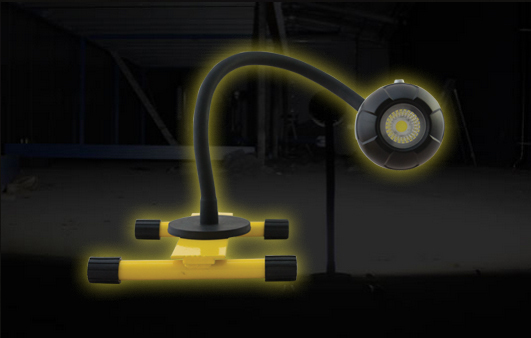 The GloForce range of mobile lighting, has revolutionised the way tradesman perform everyday tasks, helping them to light up work sites far brighter and for an increased length of time than other cordless solutions available. Alongside that, Gloforce has engineered a range of casings and attachments that provide additional support and enable each floodlight to be adjusted to suit any environment. Transforming a single use floodlight into a multi-use tool, worthy of any kit list. While GloForce is redefining the way floodlights are used in industry, they’re also making use of innovations to enhance the lives of people in the domestic market. The very same “magnetic gooseneck” that can be found in their EYE-LIGHT has been used to create a tablet holder with a twist, named the padmag. Convenience and versatility are the defining features of the GloForce range and will continue to drive it’s innovation within both the industry and domestic markets for years to come.